Capsicum vegetable also known as Bell Pepper, sweet Pepper or Pepper. 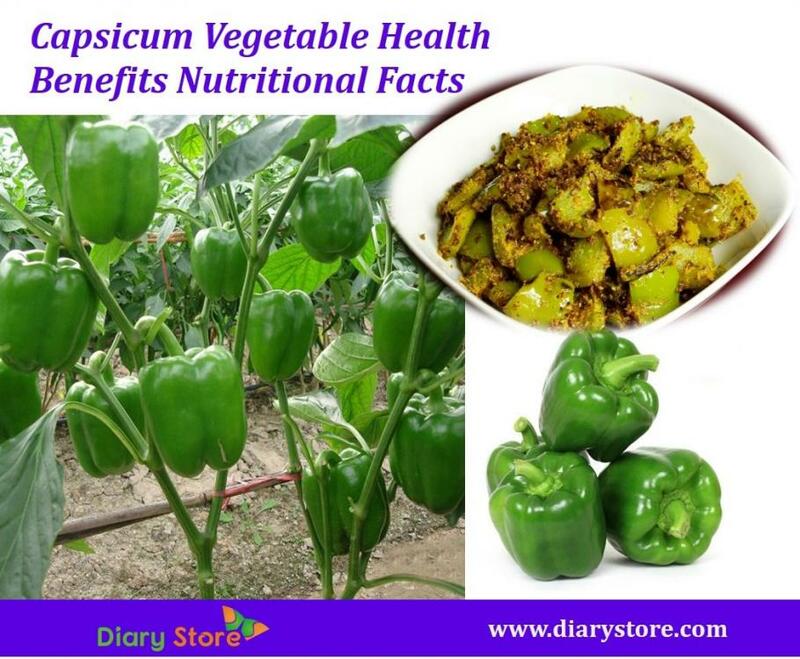 Capsicum scientifically classified by Capsicum annuum and its belongs to the Nightshade (Solanaceae) family. They are available in different colors such as yellow, red, green, and orange and purple. Purple and green Peppers are slightly bitter in taste and red, orange, yellow are sweet to taste. You can be eaten both raw and cooked. Capsicums are available throughout the year. Capsicums are native to the America and they were cultivated in 1000 years ago. These are also used for medical purposes. You can make verities dishes with capsicum such as soups, stews, jams, salads, salsas and more. 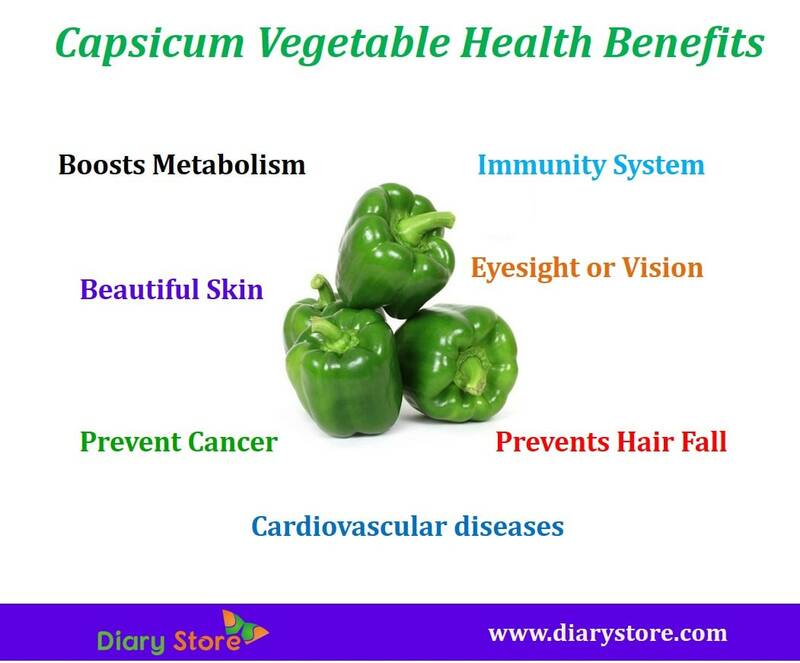 Capsicum vegetable is loaded with nutrients like vitamin K, A and C, dietary fiber and carotenoids and more health benefits. Capsicums are rich in beta-carotene, vitamin C and carotenoid which help to lowering the risk of macular degeneration of the eyes and protect from the cataracts. Macular degeneration of eyes is the most common cause of age related visual loss. Capsicum has lycopene compound it reduces unwanted oxidative stress in the body and thus prevents prostate cancer. Capsicum contains high amount of vitamin C which is essential for hair growth. Deficiency of vitamin C can cause dry, splitting hair that breaks easily.Capsicum helps to prevent dandruff, hair splitting and promotes hair growth. Capsicum are loaded with antioxidants protects the skin from free radicals thus promoting healthy and younger looking skin. Peppers are rich in lycopene, Fiber, Vitamin A, C and folate which helps to reduce free radicals and lower homocysteine levels. Increased homocysteine levels can lead to a higher risk of heart diseases. Capsicum keeps your heart healthy. Vitamin C and flavonoids present in capsicum which helps to prevents respiratory problems like asthma, wheezing, emphysema and lung infections. Capsicum contains low calories, it aids weight loss. Capsicum increase metabolism by lowering triglycerides. Capsicum also prevents indigestion by causing the secretion of digestive diseases.